This is my favorite dish to take to holiday gatherings. 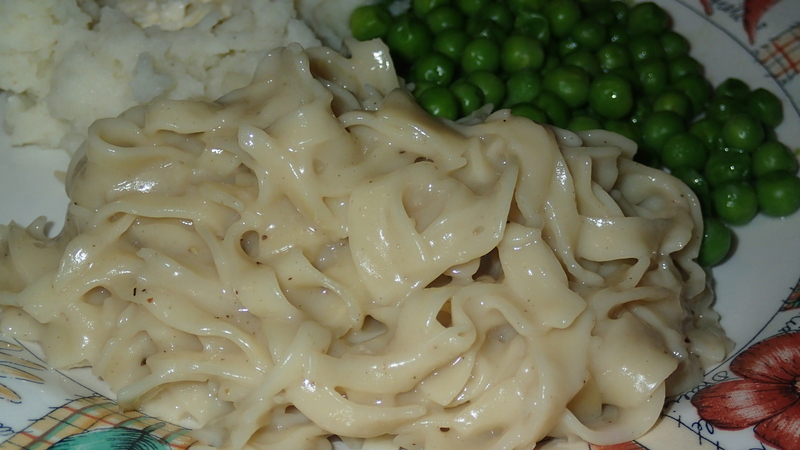 Thanksgiving just isn’t the same without it and my entire meat-loving family absolutely loves these chickenless noodles! With all this wintery coldness, I just wanted some warm, creamy, comfort food and turned to my favorite dish! This vegan version of chicken & noodles is uses Edwards & Sons Not Chick’n Bouillon which is my all-time favorite vegan chick’n broth. You can get it at Kroger, Scott’s & Marsh stores. You may also be able to find it at other local groceries in the natural foods section or you can purchase it online at www.edwardandsons.com/es_shop_bouillon.itml . The noodles are the Kroger brand eggless noodles. You may find something similar at your store. Or you can even make your own which I’ve been known to do when time permits. The gravy is also a great base for a chickenless pot pie or use less flour for a chickenless gravy to top your mashed potatoes! tender and it becomes almost transparent. until well combined and lump free. Add water/flour mixture to skillet. until well combined and lump free. Add milk/flour mixture to skillet. stir to combine with water mixture. over med-high heat, stirring occasionally to keep lump-free, until desired consistency. Toss with cooked egg-free noodles and add remaining bouillon cube. Mix on low heat until bouillon is completely melted and mixed thoroughly. Pepper to taste. Note: The bouillon has plenty of salt so there is no need to salt these noodles.